Role: Batsman, Left-handed batting style. Brian Charles Lara is a former West Indian international cricket player. He is popularly known as one of the greatest batsmen of his era, and is said to be one of the finest ever to have graced the game. He has the top Test batting ranks and holds several cricketing records. Brian Lara, ‘Prince’, started playing cricket at the age of 6. Although at school he played for Trinidad's junior football and table tennis side, it was cricket which really drew him. He learnt his game at the Harvard Coaching Clinic. At 14, he made 745 runs at 126.16 overs, and earned a spot in the Trinidad Under-16 team. In 1990, aged 20, Lara became Trinidad and Tobago's youngest captain, leading them to victory in the Geddes Grant Shield. Also, in the same year he made his Test debut, scoring 44 runs in 6 overs against Pakistan. In January 1993, Lara made a mark for himself in the international cricket scene by scoring a 277 in Sydney, against Australia. This, also, led West Indies to win the Test series. Lara has several world records under his name for high scores. He has the highest individual score in both first-class cricket (501 not out for Warwickshire against Durham in 1994) and Test cricket (400 not out for the West Indies against England in 2004). Lara amassed his world record of 501 in 474 minutes off only 427 balls. He hit 308 in boundaries (10 sixes and 62 fours). Also, in the same season, Lara scored six centuries in seven innings while playing for Warwickshire. He is the only man to have reclaimed the Test record score, having scored 375 against England in 1994. Also, his 400 not out score made him the second player after Donald Bradman to score two Test triple-centuries, and the second after Bill Ponsford to score two first-class quadruple-centuries. He has scored nine double centuries in Test cricket, second only to Bradman's twelve. In 1995, in a Test match against England, Lara scored 3 hundreds in three consecutive matches, which earned him the Man of the Series award. In 2001, Lara was named the Man of the Carlton Series in Australia with an average of 46.50, the highest average by a West Indian in that series, scoring two half centuries and one century against Australia. That same year, Lara amassed 688 runs in the Test series against Sri Lanka, making three centuries, and one fifty. These extraordinary performances led some of his fellow cricketers to state that Lara was the most dangerous batsman they have ever faced on the field. Under his captaincy from 1998 to 1999, the team played against Australia in a four-Test series, with Lara scoring 546 runs including three centuries and one double hundred; in the second Test, he scored 213, while in the third Test he scored 153. This amazing performance earned him the Man of the Match award for both matches, and also named him the Man of the Series. In 2003, Lara was reappointed as captain of the West Indies team, and on a tour against Australia, he displayed a stellar performance by scoring 110 in the match. Under his showmanship, the team won several matches such as the two Test series matches against Sri Lanka, and the ICC Champions Trophy in England in September 2004. His third term as the captain was in the year 2006, where Lara led his team to successful One-Day series victories against Zimbabwe and India. Also, his team were runners-up in both the DLF Cup and the ICC Champions Trophy in the same year. On April 2007, Lara announced his retirement from all forms of international cricket. After his last match, in the post-game interview he asked the fans, "Did I entertain? ", to which he received a resounding cheer from the crowd, after which he went out and took his 'lap of honor' where he met and shook hands with many of the fans. Lara stated this would be his last appearance in international cricket, but he also indicated his interest in retaining some involvement in the sport. In 2007 Lara was signed in for the Indian Cricket League, and is the former captain of the Mumbai Champs. Tragedy stuck when he suffered a fractured arm, and was kept out from the IPL season. Nevertheless, he returned and on 2010, he appeared in a match against Pakistan, scoring 37 from 32 balls. 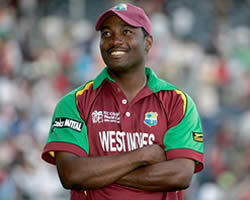 As of 2013, Lara is currently involved with the Bangladesh Premier League team, Chittagong Kings as their "ambassador".